Worried about being seen using your ignition interlock device by friends and family? Do you want be discrete in public areas? Want to avoid coworker gossip? The Interlock Cup allows you the user to be discrete and avoid those awkward embarrassing moments. By cleverly disguising the ignition interlock it will appear as though you are drinking a beverage not blowing into a car breathalyzer. Furthermore, the InterlockCup can help protect the interlock device from costly damages which you the user can be liable. SPEAKER GRILLS: Speaker openings are strategically placed to allow the user to hear prompts from any Interlock Device. FITS IN MOST CUPHOLDERS: The InterlockCup allows the user to place the device into the cup holder of the vehicle thereby minimizing the risk of the device falling to floorboard and making it convenient for use. SLIDING WINDOW: The sliding door opens for visualization of the interlock display and permits access to buttons. It easily closes to keep up a stealth appearance. TWO PART DESIGN: The two-part patent pending design allows for a permanently tethered device or devices with large bulky connectors to be placed into the cup. SNUG FITS IID’s: Fitted Insert is specifically made for the QuicTest interlock device. The insert conforms to the Ignition Interlock device keeping the device in place, thus alleviating rattling. 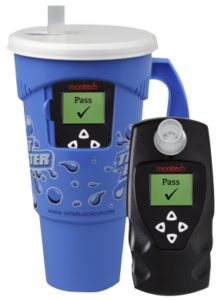 While the InterlockCup adds a protective barrier between the Interlock device and the environment, Stealth Concepts LLC, the Master Distributor of the InterlockCup, does not guarantee the InterlockCup will protect the user’s Ignition Interlock device from damages. Scenes used in the videos contained in this website may not show the cord of the ignition interlock device. The QT-2 Ignition Interlock system does have a cord which does have to be connected for use of the Ignition interlock system. Color schemes of the InterlockCup may vary from those depicted in the website.